Business requirements are constantly changing and demands on IT are higher than ever before. To keep up with the market, you need a well thought-out cloud strategy that is more than just outsourcing IT or choosing the right solution. 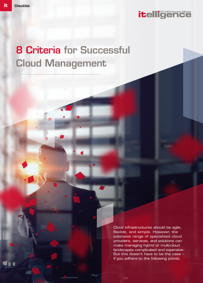 Cloud infrastructures should be agile, flexible, and simple. However, the extensive range of specialized cloud providers, services, and solutions can make managing hybrid or multi-cloud landscapes complicated and expensive. But this doesn’t have to be the case – if you adhere to this checklist. 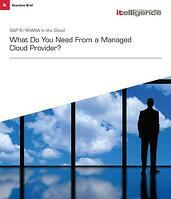 What Do You Need From a Managed Cloud Provider?